The Founding Fathers worked hard to come up with a Constitution that would stand the test of time. They had both the foresight and humility to know that with changing times there would be a need to change the charter for the US government. Beyond that, the Declaration of Independence had asserted the People possessed a Right of Revolution. Including an amendment process provided a method to exercise that Right of Revolution without the resort to arms, and placed the power to change the Constitution where it belongs, with the people. Article V provides two ways to propose amendments. The first, and only method that has ever been used, is for two-thirds of each House of Congress to pass a resolution proposing an amendment and send it to the States for ratification. If 3/4 of the states ratify, then the proposal becomes part of the Constitution. The President, whose position is defined in Article II, has no official role in the amendment process. The second method is for two-thirds of the State legislatures to apply to Congress to call a Convention for the proposing of Amendments. Article V does not provide Congress discretion once the 2/3 threshold is reached. Article V directs that “Congress shall” call the convention. This method has never been used, though its existence is credited with ratification of the 17th Amendment providing for the popular election of Senators. In the book The Sword of Liberty, author Loren J. Enns, combines an action/adventure story with a message about the value of a Convention to Propose Amendments. It is both entertaining and educational. Originally, Article I directed that State Legislatures choose Senators and not by the direct vote of the people. Many states had begun to hold popular elections for United States Senators. State law or custom directed that the legislature choose the winner of the popular election. Technically the legislature was still choosing the Senator as directed by Article II; the reality was many states chose their Senators by popular vote. A movement arose to change to direct election of US Senators nationally, but this required a constitutional amendment. Most Senators had been chosen by the legislatures and were reluctant to send an amendment to the states changing the system by which the Senators had gotten their jobs. States favoring the direct election of Senators began sending applications to Congress for an Article V Constitutional Convention. Congress, concerned that a convention might not confine itself to that single issue, ultimately proposed the 17th Amendment, which was ratified in 1913. It was the threat of an Article V Convention that resulted in the 17th Amendment. Article V allows for two methods of ratification. The first, ratification by three-fourths of the State legislatures, has been used for 26 of the 27 amendments to the Constitution. The second method for ratification is by state ratification conventions during which citizens are elected in each state and meet for the sole purpose of considering a proposed constitutional amendment. Ratification requires passage by three-fourths of the state conventions. This method has been used once, for the 21st Amendment, repealing the 18th Amendment and Prohibition. Article I, section 9, clause 1 dealt with the slave trade and bringing new slaves into the country was expressly allowed by that clause, and there was a prohibition regarding changing the clause before 1808. 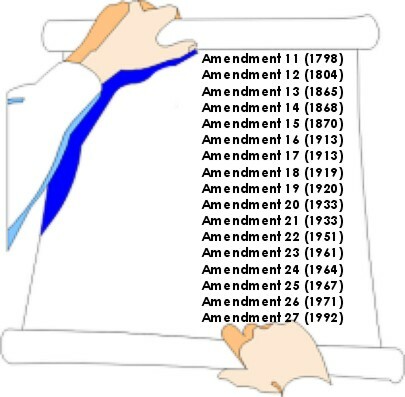 Amendment to clause 4 was prohibited prior to 1808; that clause limited imposition of direct taxes prior to the conduct of a census. The Constitution may not be amended to reduce a State’s vote in the Senate. The Founding Fathers provided an amendment process, making it difficult on purpose. The Constitution was to have continuity and not to be easily changed by short-term popular sentiment. This has been effective. Congress has sent only 33 amendments to the states for ratification, and only 27 have passed, despite thousands of proposals. Of the 27 that have been ratified by the States, the first 10 known as the Bill of Rights, were ratified just four years after the Constitution was adopted. The next 17 were added over a period of more than 200 years. The Supreme Court has assumed the power of final interpreter of the Constitution’s words. Over the 229 years of its existence, the Court, through its opinions, has changed the way the Constitution is read. For example, neither the Miranda Warnings, nor abortion rights are found explicitly in the Constitution, yet the Court has given them Constitutional status. When the Supreme Court changes the way the document is read, then in effect it has judicially amended the Constitution, even though the words of the Constitution have not been changed and such power is not granted to the court in Article III. Because the Supreme Court has taken upon itself powers to change the effect of the Constitution that were reserved to the people through Article V the nomination process for members of the Court has become contentious. The additions of Justices Gorsuch and Kavanaugh provide hope that the Court’s role will recede and constitutional changes may return to the Article V process of approval by the people rather than imposition by the Justices. There are currently several major efforts to employ the Article V provision for a convention called by the states to propose amendments to the Constitution. One of these efforts is the Compact for America. A leading proponent of the Compact for America is Nick Dranias. Mr. Dranias has researched the Founders view of an Article V Convention. The issues involved and the Founders’ view are explained in a three part series that begins with: Compact for America Solution to Article V Convention Issues According to the Founders, Part I .